I can’t tell you how excited I am to be releasing my second book. This one has been a long time coming as I first started writing it a few years ago. 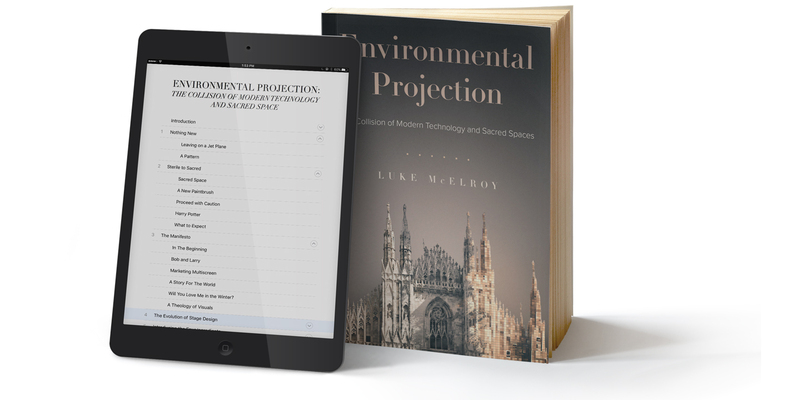 It’s wrapped in great theology, as I uncover a lot of the “why” behind creative arts in the church, but I also spend the second half of the book taking you through a very detailed step-by-step process to setting up environmental projection (or large format projection). I’d love for you to check it out! Here’s the link to get more information and if you fill out the form, I’ll hook you up with the first three chapters of the book for FREE! My hope is that it’s a great resource for you as you process creativity, the church and how to bring back sacred spaces in new ways for your community.